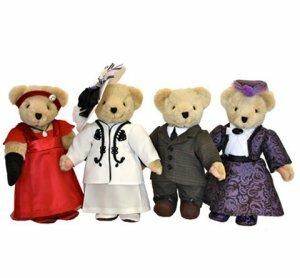 !2", 2014, Collection of the four main characters of the very popular PBS series Downton Abbey®. (Left to right) Lady Mary Crawley in red, Cora Crawley, Countess of Grantham, in white, Robert Crawley, Earl of Grantham, and Violet Crawley, Dowager Countess of Grantham in purple damask. Downton™ and Downton Abbey®. © 2014 Carnival Film & Television Limited. All Rights Reserved.